Are you ready for an inter-galactic adventure? It is time to explore the vast universe in this space themed online slot game, Star Spinner. Let the futuristic beats send you shooting off into the universe, and check out the cool space themed symbols on your way. This slot game combines the classic bell, bar and fruit symbols, with this funky theme with purple planets, diamonds in the sky, coloured shooting stars and rainbow reels. With crisp bright graphics and equally impressive audio, this game will have you spinning all day. Blueprint gaming have been consistently creating fun and engaging games that draw players back time and time again. Having both land based and online experience really gives them an edge in the industry. They have proved themselves to be a big player in online gaming and have released top notch games, time after time. Star Spinner highlights the talent they possess in combining top quality audio with sharp and attractive graphics to provide an amazing and immersive gaming experience that players will continue to return for. If you enjoyed this game, Top Cat is an example of one of the big franchises they have sunk their teeth into and transformed into a fun and simplistic slot game. You know that old cliché about human beings being made of stardust? Well its turns out that it is likely to be true! A survey conducted in 2017 studied 150,000 stars and apparently, us humans have about 97% of the same atoms that the galaxy has. The elements that we need as a species for our very survival, are oxygen, carbon, hydrogen, phosphorus, sulphur and nitrogen and astronomers, for the first time in human history have catalogued these elements in the huge sample of stars. Pretty cool huh! We might be stuck on earth at the minute, but in this online slot game you can reach for the stars and the big wins, so how do you play? THE WILD SYMBOL: The Wild in this game is represented by the Star and it substitutes for all symbols on reels 2, 3 and 4, except any Scatter symbols or Bonus symbols. STAR SPINNER BONUS: If the Star Wild lands on reels 2,3 or 4 the Star Spinner bonus is triggered. During this bonus, the Star Wild will expand to cover the entire reel and remains in place while the other reel’s re-spin. If another Star Wild appears during a re-spin, it expands and stays in place for another re-spin. Up to 2 additional Star Wild symbols can appear after a Star Wild activates a re-spin, triggering 1 additional re-spin for each new Star Wild symbol that lands on the reels, with a maximum of 3 re-spins. JACKPOT KING AND WHEEL KING: When 5 Jackpot King symbols appear on the reels the bonus is triggered. 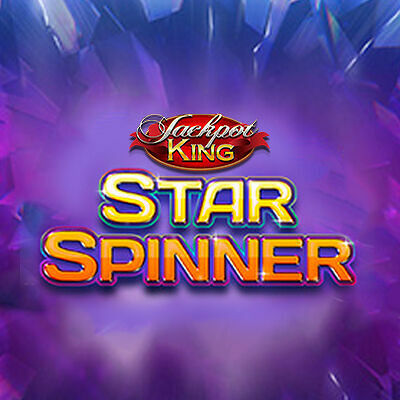 Collect up to 15 crowns and trigger the Wheel King Feature to win the big jackpot. Blueprint gaming have hit the jackpot with this star studded, easy to play, engaging online casino slot game. Spin your way through the galaxies and shoot for the stars.